Sometimes creamy soups can be very unhealthy. This healthy cream of mushroom soup is going to change all of that! You can whip this up at home for a tasty alternative to the canned stuff. Bonus? You can customize this to any cream of vegetable you’d like–asparagus, celery, broccoli, anything! 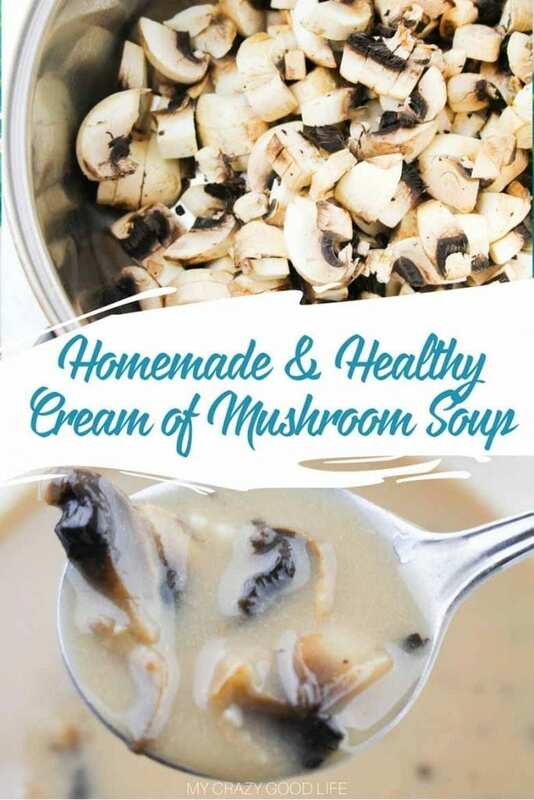 With only a few ingredients this healthy cream of mushroom soup is a win win! You don’t need a lot of fancy stuff to make this tasty recipe. I love using this cream of mushroom soup in my healthy tuna casserole recipe. For those of you who are looking for clean eating options, you definitely want to give this recipe a try. I also put together this clean onion soup mix! Can you freeze homemade Cream of Mushroom Soup? If you are preparing food for the whole week, check out these meal plan tips. 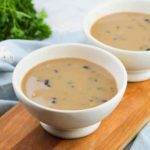 This healthy cream of mushroom soup is perfect for lunches on the go during the week. You can make a batch and heat it up as needed! I love making multiple batches of this soup and sticking it in the freezer! I usually freeze it in 1 cup portions and pull out a bag when I’m making a casserole. I make sure to stir the cream of mushroom soup well before I put it into freezer bags so all the mushrooms don’t fall to the bottom. How do you make healthy Cream of Mushroom soup? 1. 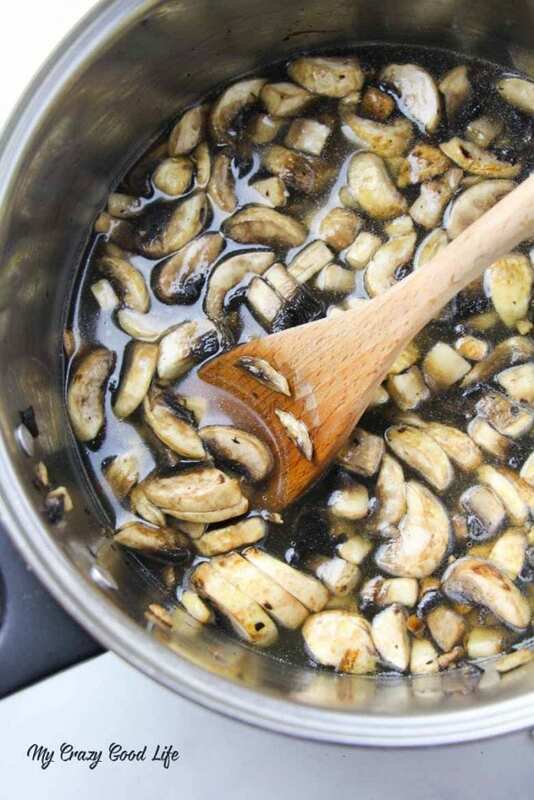 Sauté mushrooms with oil until tender, add balsamic vinegar and flour or substitute. 2. Into a large pot, pour chicken stock and mushroom mixture. 3. Add almond milk, allow liquids to come to a rolling boil and then simmer for 8-10 minutes. 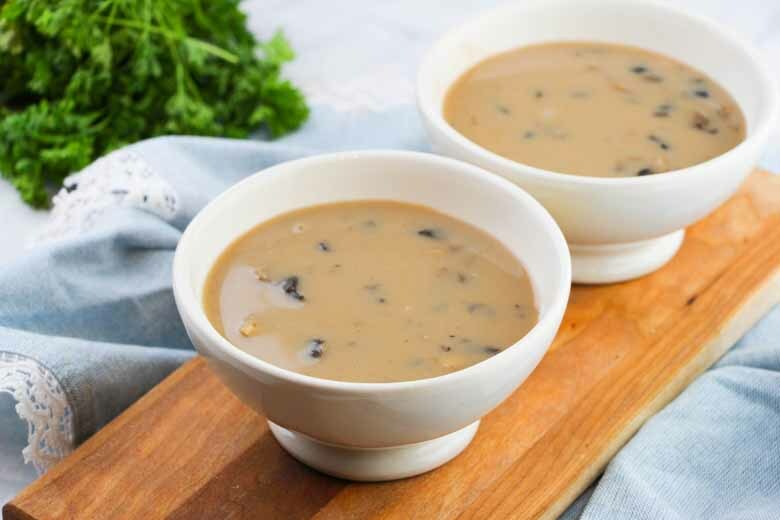 What recipes can you use this healthy cream of mushroom soup in? 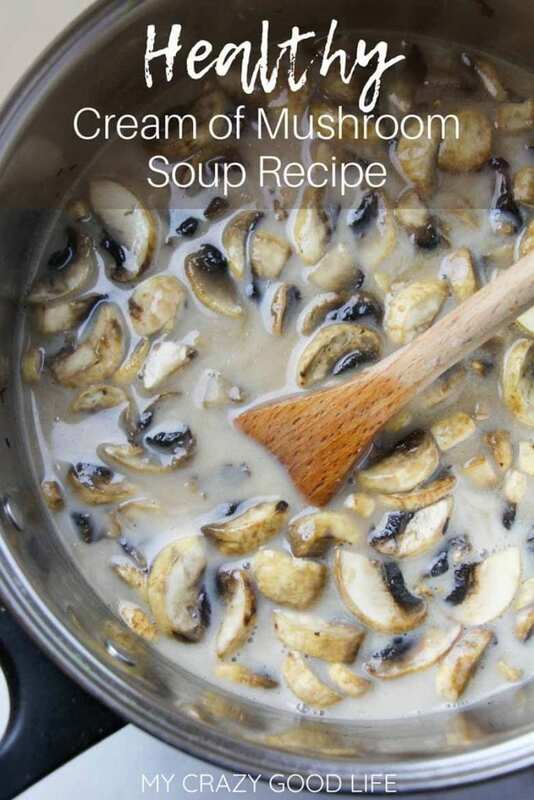 These are my favorite recipes to use homemade cream of mushroom soup in! You might need this homemade onion soup mix too! Sometimes creamy soups can be very unhealthy. This healthy cream of mushroom soup is going to change all of that! You can whip this up at home for a tasty alternative to the canned stuff. Sauté mushrooms with oil until tender, add balsamic vinegar and flour or substitute. Into a large pot, pour chicken stock and mushroom mixture. Add almond milk, allow liquids to come to a rolling boil and then simmer for 8-10 minutes. Do you think this can be frozen for future use as a base for like chicken and rice? Freeze it in cup size portions? Do you think it would be possible to substitute something else for the almond milk, in a nut allergy house? I bet soy milk would work! What do you usually drink? Soy is another no no (allergies to that as well). I usually use coconut milk (like Silk brand, not the canned kind) but I feel like that might taste weird in a cream of mushroom soup. I’d totally try it and see! I like the ingredients, but how thin is the end product? Would blending half be a good way to thicken it or would you say it’s already thick enough? It’s thin–I’d add some more thickener or bulk it up with some extra mushrooms!